“Hair today, gone tomorrow” has been the motto for millions of women and men over the past decade who sought laser hair removal to look their best and save time. Each laser pulse takes a second and can treat numerous follicles. In just six to eight treatments on average, depending on treatment area, hair type and density, the client can enjoy silkier, hair-free skin. Laser hair removal was not always so easy. The first generation of laser hair removal technology focused mainly on heating up the hair follicle, and machines were not accompanied by pain-reducing features. Still, it was generally considered faster, less painful and more convenient than waxing or electrolysis. However, its capabilities were also limited by the types of skin and hair it could effectively treat. The ideal candidate for early laser hair removal treatments had dark hair and light skin. The skin of darker-skinned and tanned individuals contains more melanin, and less advanced lasers had difficulty distinguishing between hair follicle and surrounding skin, thereby heating up both significantly. The results were often uneven, unsuccessful and in the worse cases, harmful. Before this article goes into more detail, it should be noted that laser hair removal is legally termed laser hair reduction. Today’s laser hair removal treatments have improved significantly. They are faster, more efficient and perhaps best of all, less painful due to features such as integrated chilled tips, cold air flow or mini blasts of cryogen spray before each pulse to cool and numb. There are a number of both laser and intense pulsed light (IPL) modalities to treat multiple skin types and concerns. Recent advances in laser hair removal and IPL are discussed below and include: different wavelengths, radiofrequency, treating follicle inflammation and laser hair thinning. Several different wavelengths of laser energy are now safely and routinely used for hair removal, ranging from 755 to 1,064 nanometers (nm). The best for Fitzpatrick I–IV is 755 nm, though extra caution should be used on type IV and is not recommended at some facilities (including National Laser Institute). Pulsed diode at 810 nm is also used on types I–IV. The preferred treatment for darker skin types, i.e. types IV–VI, is 1,064 nm with a yttrium aluminium garnet (YAG) laser, though it can be used on most skin. Longer wavelengths will not burn the skin when trying to get rid of the hair. There is also an 810 diode IPL that can be used on pale to medium skin types. IPL is not technically a laser, but the results are similar. Interestingly, 1,064 nm and 755 nm wavelengths are also commonly used for laser skin facial treatments. One of the most exciting advances in laser and IPL hair removal is the addition of radiofrequency (RF). This combination is ideal for at least two reasons. First, unlike laser and IPL, RF is not attracted to melanin. Instead, the laser and IPL are used to channel a path from the instrument to the follicle, thereby destroying it and at the same time, delivering RF’s warming effects to surrounding tissue. Second, when the water molecules in the dermis are heated by RF, collagen production is stimulated and the result is younger, tighter looking skin. What client does not want hair reduction and firmer skin? Laser and IPL hair removal treatments are not just for getting rid of unwanted hair. They can be used to treat conditions related to inflammation of the hair follicle such as ingrown hair and razor bumps. There are two types of pseudofolliculitis barbae (PFB): one grows out of the follicle, curls and grows back in, i.e. ingrown hairs; the other is simply inflammation of the follicle due to the individual hair’s curved nature, i.e. razor bumps. PFB appears as flesh-colored bumps with a hair shaft in its center. In some people, pustules accompany the bumps, making them look like acne. Left untreated or treated improperly, ingrown hairs and razor bumps can lead to hyperpigmentation, pain and scarring—both physical and emotional. By destroying the hair follicle with lasers or IPL, any related inflammation is destroyed. Curved hair that is cut short to then grow back into the skin form a similar condition called folliculitis keloidalis nuchae (FKN), which occurs on the back of the neck and hairline. This condition can actually lead to a stubborn type of acne where dark keloids form on the back of the neck, and its sufferers benefit greatly from laser or IPL hair removal. Clients with excessive body hair in places where they might not feel comfortable with full laser hair removal, but would still like to get rid of the hair, can have nice results with laser hair thinning. This procedure only deactivates some of the hair follicles, thereby making the hair appear thinner. It is achieved in fewer treatments than full laser hair removal and spaced out over a longer period of time. The cost would also be less than full area removal. With laser hair removal technology continuing to improve at a fairly rapid place, one might assume that there are treatment options now available for gray, blonde and red hair. Unfortunately, the answer is still no. Both laser and IPL work by targeting melanin in the hair shaft. When there is no or little melanin, there is no result. Therefore, until there is a way for either laser or IPL hair removal to work its way around the melanin issue, the answer will remain the same. There have been a lot of claims to the contrary, even from people in the industry whom are highly respected professionally. Fairer haired clients are not going to be happy with the results of any attempt at laser or IPL hair removal. Don’t let anyone tell you otherwise. New technology is getting us closer to hair removal for gray, red and blonde hair, but we are definitely not there yet. Laser and IPL hair removal are more popular than ever before. They remain one of the top requested treatments for many medical spas. However, just because they are widely used does not mean they don’t come with strict safety guidelines. Everyone is different, but treatments need to be performed during an active hair growth cycle. There should be no sun exposure when getting hair removal treatments, no tanning and no use of photosensitizing medications such as isotretinoin. Additionally, the body should not be heated for two days following a treatment, including: hot tub use, excessive exercise or sitting in a steam room. Laser safety protocol must always be taken seriously to avoid injury. In the wrong hands, lasers can burn, scar, discolor and induce significant pain. For everyone, but particularly for clients of color with naturally higher amounts of melanin, laser and IPL experts should be used who have trained under the best instructors with all skin types. A credible laser technician will never tell a client over the phone that they can treat their skin type/hair color without asking a series of questions. Nor will they tell them the exact number of treatments they will need without an in-person consultation. Experienced technicians will always perform a test spot to determine how skin will react to a particular machine before performing a full treatment. A few aspects of laser hair removal haven’t really changed at all, and that is a good thing. Follow-up treatments are still scheduled four to eight weeks apart, the time length depending on the body area that’s being treated. It is exciting to think what the future may hold for this still-booming sector of medical aesthetics. Technology continues to evolve, and laser/IPL hair removal continues to become more precise and diverse. 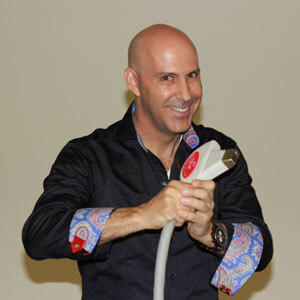 Louis “The Laser Guy” Silberman is president and founder of National Laser Institute, the largest cosmetic laser and medical esthetic training center in North America. He is an expert in medical esthetics, a medical spa owner and a nationally recognized author, marketing speaker and business consultant. Silberman can be contacted at 800-982-6817 or louis@nlionline.com.